It was 1967. Hugh O’Brien, famous as TV’s Wyatt Earp, was the star of a USO tour in Vietnam. After every performance he’d choose a volunteer to join him in a quick-draw contest. I watched from the stage, along with the entire cast of Guys and Dolls, as the soldier was hoisted up by his cheering buddies and tried to out-draw O’Brien. In New York O’Brien had played ‘Sky Masterson’, the gambler who falls for a Salvation Army girl. The show was closing, so he contacted someone he knew in the State Department. “This show would be great for our boys in Viet-Nam,” he said. We were hired the same week. Our USO troupe consisted of thirteen singer/dancer/actors, as well as four musicians. Over three weeks we performed shows for the Army, Marines, Air Force, and Navy, including on two aircraft carriers in the Gulf of Tonkin. Everybody was sent to a government health clinic for a series of shots against tropical diseases. A month later, after stops at Air Force bases in Maryland and San Diego and refueling in Taipei, we arrived at Tan Son Nhut airport near Saigon. My first impression of Vietnam was hot, hot, hot! I had trouble breathing in the damp, sticky, humid air. We were quickly herded onto military buses for the drive to our hotel, the Meyerkord. All the entertainers stayed there, we were told, including Bob Hope and Ann Margaret. I wondered if they’d enjoyed the narrow, iron-framed beds festooned with mosquito netting, soggy mattresses, and creaky ceiling fans. The lobby had a few armchairs and potted plants. Later I heard that a bomb was discovered in one of the plants before our arrival, but it didn’t scare me. Hey, I was young and inexperienced. Oblivious. 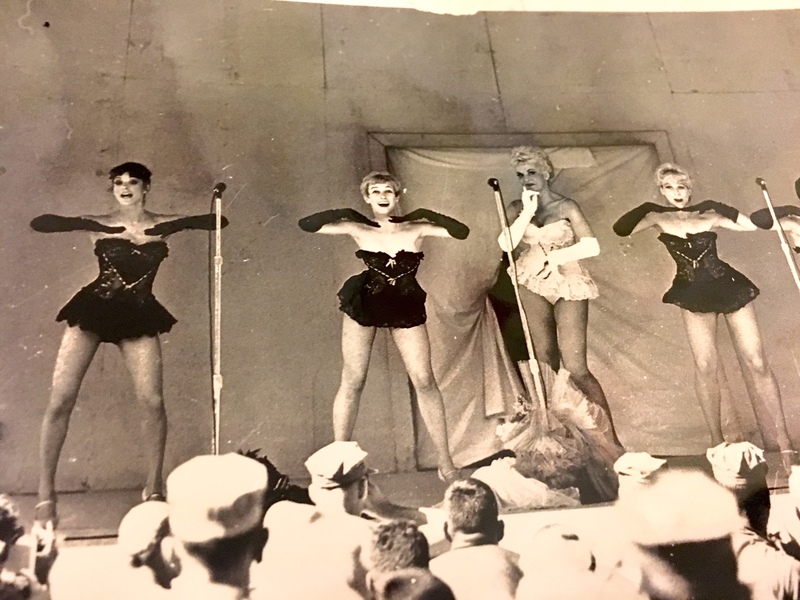 Over the following weeks we played Guys & Dolls for thousands of officers, non-coms, and enlisted men. We traveled in planes and helicopters of all sizes and shapes. We were treated like visiting royalty wherever we went. If I had any doubts about our country’s involvement, I had none about giving the men a ninety-minute break from the harsh reality of the war. One day, while traveling back to our hotel after a show, I peered out the steel-mesh covered bus windows and saw some children. They were playing in a dirt-covered yard, surrounded by a rickety bamboo fence. Who were these children? What were they doing there, a few hundred feet from our hotel? Our liaison officer had warned us not to go into the streets alone, but I was curious. When no one was looking I left our hotel, ran to the fence, and stopped at a closed gate. A bell hung on a rope. I rang it, wondering if I should get the hell out of there. A Vietnamese woman in Catholic nun’s habit emerged from the building. “What do you want?” she asked, with a thick French accent. When I answered in French, her face lit up. “I want to know about the children I see here,” I said. “But who are you?” she asked. I followed her into the building. It had bare walls, dirt floors, low ceilings, and ragged fabric hanging to delineate separate areas. There were no doors. A few children wandered around, aimlessly. There were no toys, no coloring books, absolutely nothing. “This way, please,” the nun said. At the end of a dark hallway we entered another room. I saw two rows of baby cribs, perhaps nine or ten. Each crib held several babies. “You may look,” the nun said, standing alongside one of the cribs. I walked over and peered inside. There were five babies. Two wore soiled cloth diapers; three were naked. None moved. None looked up. Their eyes looked like buttons on a stuffed toy. No expression. Hopeless. Dead. I had never seen anything so pitiable. I left the room, too upset to speak. The nun followed me. “Where do they come from?” I asked her. She folded her hands in front of her. I emptied my purse and gave her all the money I had. It was only thirty dollars and change. “God bless you,” she said, leading me outdoors. As we passed the toddlers in the yard, I realized they were barely clothed. Most wore soiled-looking diapers that drooped around their knees. Some looked emaciated. None showed any expression. When we reached the gate, she stopped. “Thank you for coming today,” she said, grasping my hands in hers. She held the gate open for me to leave. When I turned to say goodbye, she wasn’t there. I saw the back of her habit flutter in the doorway, as she walked into the building. To this day I cannot understand why I didn’t tell the other performers in our company. I’m sure many of them would have wanted to help. Was it because I’d broken the rules? That I’d been forbidden to go outside and was afraid I’d be in trouble? Or was I so upset by what I’d seen that I couldn’t talk about it? Whatever the reason, I am haunted by the memory of those babies. I have never seen such hopelessness in a human face. I saw a different kind of hopelessness when we visited a hospital ship, docked off the coast of Saigon. “Do I have to?” I asked our liaison officer. I hate the sight of blood. I was uncomfortable even before we arrived. We went on board and entered a depressingly large ward. Two long rows of folding cots ranged down both sides. Each bed held a wounded soldier. I smiled and spoke to a few. Most were so drugged they could barely respond. As I walked from bed to bed, I saw depressions in the blankets were one or both legs were missing. I was afraid to sit anywhere. I spotted one bed that looked intact. Its occupant looked like a young kid. Fifteen or sixteen, at best. I wondered if he’d lied about his age to enlist. He was skinny, with wispy red hair, translucent white skin covered with freckles, pale green eyes. I sat down. “Where are you from, soldier?” I asked, as per instructions. “Ah’m from Kentucky.” He stopped. Stared. Seemed to be studying me. Suddenly he reached out and grabbed my hand. He paused. His pale eyes flickered. A spasm shook his entire body. I had no answer. I stayed with him until he’d relaxed his grip. He turned away and closed his eyes. I hoped my visit had given him a moment of comfort. I felt helpless. Stupid. Futile. Suddenly I heard shouting from halfway down the ward. Several orderlies were running towards a bed where a man thrashed and screamed like an animal being slaughtered. The orderlies jumped on him, trying to hold him down while shouting and hitting him. I was horrified. After a few minutes the screaming and pounding stopped. “What was that?” I asked the nearest orderly. I tried to stick it out, but I was too upset. I had to excuse myself from the rest of the visit. A few days later we flew to an isolated base on a mountaintop in the Central Highlands. The landing was hair-raising. We thumped and jittered over huge potholes and uneven terrain that served as a runway. Looking out the window, I spotted the wreckage of several airplanes. “This runway is actually too short for this type of plane,” our liaison officer said. Now you tell me? That day we gave two shows, the last at twilight. From the scaffold-like stage I saw a tall column of black smoke, curling in the distance. What was that? There was a noticeable darkening of mood from everyone, soldier and performer alike. We ate a somber dinner in the Officers’ Club; then went to the non-coms club to socialize with the men. I sat in a quiet corner, sipping a coke. Hanging on the wall I saw a dark wooden crossbow and a quiver made of tree bark. The non-lethal ends of the arrows were fitted with pieces of bamboo. “Are you admiring the crossbow?” a male voice asked. I looked up. A middle-aged staff sergeant was standing near the crossbow. “I’d like that,” I said. The guy had a quiet, reflective energy that struck me as unusual in a non-com officer. “Where are you from?” I asked, the requisite opening question. I didn’t know whether to be impressed or to feel sorry for him. “Do you have a family?” I asked, trying to stick to the suggested subjects. “Divorced. Two kids. It’s tough on them when you’re away so long. Especially when you’re working in the interior.” He paused. Gave me a quizzical look, as if wondering how much to tell me. I must have passed inspection, since he went on talking. We continued talking for most of the evening. Mostly he spoke about his life in Vietnam, his concern that the Viet Cong were more entrenched than ever, that we didn’t seem to be winning the “hearts and minds” of the Vietnamese people. When I looked around, I saw that many of our group had left. “I should be going soon,” I told him. He removed the crossbow and quiver from the wall. “You bet. Went right through the fuselage and killed the pilot. It takes two men: one to hold it while the other shoots. They have bigger ones for four men that shoot down full-size choppers. They make everything by hand – bow, quiver, and arrows.” He pulled out a single arrow. “This is the first time since I’ve been in this country that I’ve felt like a human being. Like – someone’s friend. I want you to have it.” He handed me the bow and quiver. “I’ll be careful,” I said, fighting back tears. “Well, goodbye.” He kissed me lightly on the cheek and left. 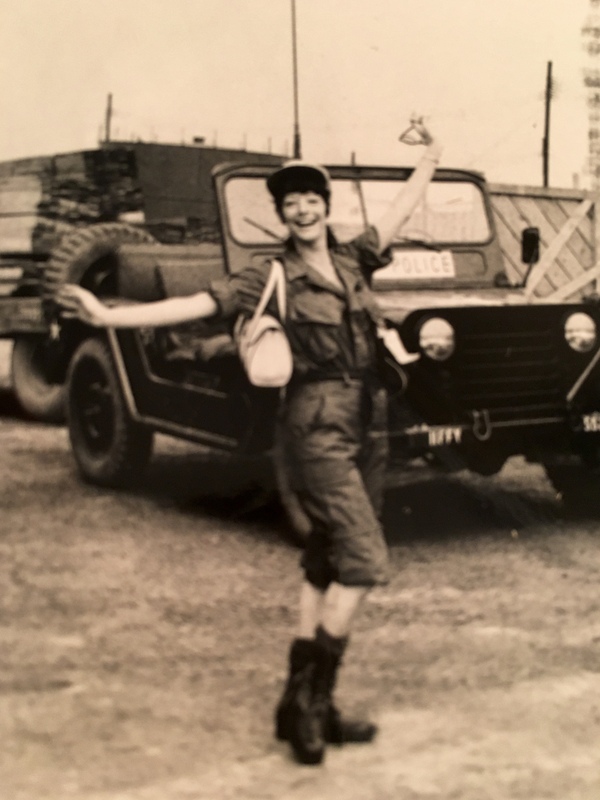 I carried the crossbow and arrows throughout Vietnam and onto the plane that brought me home. It hangs on my wall today.